After Jalen Rose confronted Skip Bayless yesterday on First Take that Skip Bayless’s high school career wasn’t anywhere near as profilic as Bayless claimed (after some fantastic investigative work by The Lost Ogle), the duo had a formal response to the situation yesterday. It really didn’t go the way we all expected. Bayless claimed he was offended by Rose’s “attacks” on his high school career, because he didn’t know the whole story. Bayless talked about being a natural shooter in high school, and the coach wanting him to become a point guard. Skip’s logic for not perfoming as a point guard: “I didn’t have the aptitude nor the desire to distribute the basketball.” Bayless then claimed that he was forced to the bench when his coach brought in his son, which is a fact. Teammates of Bayless during his senior season called him a seventh man who just didn’t fit the style at his school, and said Bayless was a good shooter. Consider how all this started. Bayless tried to compare his plight to that of Russell Westbrook, a shoot first point guard who also happens to be an All-Star. That was the basis of his tweets about his high school greatness, which was totally unnecessary and ludicrous in the first place. The problem is Bayless tried to prop himself up as a great player ala Westbrook as someone that led his team to the state finals as a starting point guard and that was proven to just not be true. Rose smartly brought up Bayless and his history of name calling and trashing various players and how athletes seemingly have an aversion to criticizing media members in the same way that Bayless tends to pick on and rip athletes. To see Bayless under much of the same pressure and criticism is nothing short of sweet karma. In short, Bayless tried to pump himself up as a high school superstar, and that was torn to shreds in what, 12 hours? Then, Rose called him on his garbage, and Bayless threw out the victim card because he was caught in a lie and tried to blame bloggers for uncovering the truth. Does that make any sense at all? 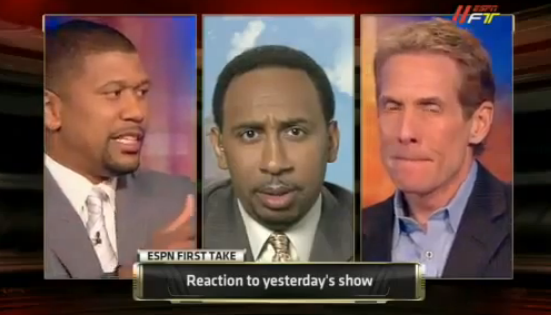 This episode proves the flawed nature of First Take more than anything else. Instead of the sports of the day being the story, it’s all about Skip Bayless, as the show has always been. Instead of insightful analysis and opinion, a nationally televised sports show spent twenty minutes today arguing about its polarizing commentator lying about his high school basketball career. Seriously. Imagine that happening on any other network in the country. It’s insane. It’s absurd. It’s… First Take.